Most packaged meals and snacks marketed to toddlers have more than the recommended amount of sodium per serving, meaning children as young as one are most likely eating far too much salt early in life, according to one of several studies on sodium presented this week. The studies were presented at the American Heart Association's Epidemiology and Prevention/Nutrition, Physical Activity and Metabolism 2013 Scientific Sessions in New Orleans. 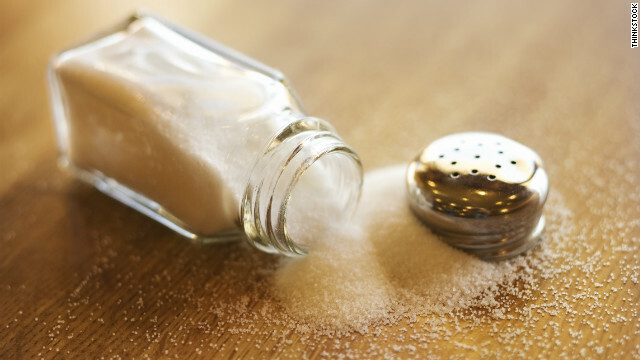 The findings were alarming to researchers since there is evidence a child's sodium intake is related to the likelihood that he or she will develop hypertension as an adult. Hypertension is a major risk factor of cardiovascular disease and the number-one killer of men and women in the United States. "The good news is that commercial foods for babies, when they start complimentary feeding from 4 to 12 months ... are relatively low in sodium," explains Joyce Maalouf, the study's lead author and a fellow at the National Center for Chronic Disease Prevention and Health Promotion at the Centers for Disease Control and Prevention. "But the products marketed to toddlers were significantly higher in sodium: more than 75% of the toddler meals and snacks had high sodium content." Maalouf and her team reviewed more than 1,100 products specifically marketed to babies and toddlers that were sold in grocery stores. Any product that had more than 210 milligrams of sodium per serving was defined as being high in sodium, based on guidelines outlined by the Institute of Medicine and MyPlate.gov for salt intake and young children. Some of the toddler meals tested had upwards of 630 milligrams of sodium per serving. Meals and "savory snacks" had the highest amount of sodium compared to the cereal bars and fruit snacks that were tested. Maalouf and her team are not releasing the brand names of the foods they tested but described the meals as being readily available in grocery stores aisles stocked with food for babies and toddlers. "We're talking meals that are pre-packed ... like mac and cheese, pasta with meat sauce, pizza, or chicken and vegetables," says Maalouf. "These are not frozen meals, they're usually microwavable." The UDSA recommends toddlers ages 1 to 3 consume between 1,000 and 1,500 milligrams of sodium daily. Maalouf says parents need to be aware that eating too much salt can be a problem in young children and encourages people to read nutrition labels before buying meals or snacks for their children. "These meals are not the only meal that kids will eat," says Maalouf. "They're growing, they're always snacking. So they're eating seven to eight servings and meals per day." Two other studies being presented at the annual meeting focus on the global effects of too much sodium. According to one, the average intake of sodium among three-quarters of the world's population was nearly 4,000 milligrams a day in 2010, almost double the World Health Organization's recommendation of 2,000 milligrams. Researchers calculated in a second study that nearly 2.3 million people worldwide died from cardiovascular deaths attributable to too much sodium in 2010 alone. "In the United States and similar countries, the burden for change lies with the government and with the food industry," says Dr. Dariush Mozaffarian, cardiologist and lead author of the second study. Mozaffarian is the co-director of the Program in Cardiovascular Epidemiology and associate professor of medicine and epidemiology at Brigham and Women's Hospital and Harvard Medical School. "Salt is spread so evenly throughout our food system, there have to be policies to minimize how much sodium we eat." Both studies were part of the 2010 Global Burden of Diseases study and were funded by the Bill and Melinda Gates Foundation. How about let's feed our kids real food, not processed trash that benefits no one but the companies that make it? Fresh fruits and veggies are what the human body is designed to eat!! My chilldren were breastfed till a year old, fed all organic baby food and rice cereal, and have eaten a nearly vegetarian diet since, with as much organic food as we can find and afford, and they are never sick. When my friends' kids complain about all the illness, the ear infections, the hyperactivity... well, I try to suggest a look at diet, but it nearly always seem to fall on deaf ears. I was fed the typical American diet by my obese mother and spent my childhood being sick all the time. Fortunately, at age 15 I was exposed to people who ate well, and I saw dramatic results the very first month I applied a healthier diet. We are killing our kids with this processed trash!! Thanks, April, for your comment. I see the results of good and bad diets in my friends and their children and it hurts to watch many of their kids grow up physically unfit. The bad diet some parents feed has to be adverse to healthy mental growth as well. Unfortunately too many make the drive thru window a regular choice when they could easily stop at the grocery and get better choices and spend less as well. While I agree with how you feed your kids, I agree with Randy. Your post makes you come off as as a smug person. Like "look how perfect I am". That may be how your friends are seeing you. No parent likes to be told they are doing something wrong. Let their kids doctors talk to them. They will more likely listen to the doc more than you. April - It DOES NOT have to be a vegetarian diet but it should be a sensible one filled with fruits and veggies and unprocessed foods. My daughter had chronic earaches when she was very young because her tubes had not grown in but I heard it from everybody who thought they knew better what was right for my child. I Did notice huge differences in our health when we moved – slowly and steadily to a mostly organic – although NOT vegetarian diet. I also know plenty of parents who put crap into their kids almost from day one - the mother who fed her toddler instant iced tea in his bottle and the mother who colored and sweetened everything her kid put in her mouth because she couldn't get him to eat. They were stupid parents; we can only hope their kids will be better parents. That's all you can do - I don't preach and I don't tell people they are doing it wrong - just becuase I think my friends hyperactive kids who drink a quart of milk a day would benefit from organic milk doesn' t mean she's going to change what she is doing and I will love her any way. OK, you're case for vegan is invalid. My kids eat what they like. Meats, cheese, fruits, veggies. They are healthy and of good weight, very active and do not get sick. My family eats what we choose and are all of good weight and health because we are active. A diet is not the sole answer. Do you even think that a primary cause of childhood obesity is due to the sedentary lifestyle some kids have with being in front of the game consoles? Just saying that you preaching the vegan way does not mean it is the right way. From my own personal experience, from going to a carnivore to being vegetarian for over 20 years now, it is night and day in comparison to how my own body feels better now. No medicine can give that much of all over benefit for an extended period of time. Good for you April! If you don't tell your friends, who will? McDonalds commercials? When my friends ask me how come my kids don't get sick like theirs do, I tell them I pay attention on their diets. I guess for some would be easer to give their kids antibiotics several times per year than change to healthy diet. I was raised on a non-vegan diet. And I was never sick as a kid. While I did't have much junk food, it wasn't full vegan. There is a difference between having natal healthy food and going vegan. Wow, April. It must feel great to be a "perfect" freakin' parent. Give me break!!!!! McDonald's once in a while isn't going to kill a kid. A popsicle once in a while...a piece of birthday cake at a birthday party isn't going to kill a kid. That is what childhood is about! Look at you miss perfect MOmmy. Not all of us can afford "organic" food at 3X the amount of regular "bad" food. Sorry. I am NOT paying $9 a gallon for organic milk. You can have a balance. Not just kids; everyone should eat real food. Learn to cook. The life you save may be your own. If you told me your anecdote it would take all I could muster to not roll my eyes and tell you to pound sand. I nursed my child longer than you and I shell out for all organic food. My daughter has had chronic ear infections since she was three months old, and we are on her second set of tubes at less than three years old due to the recurring eardrum ruptures. Diet has nothing to do with this. The internal structure of her nose does. People should learn to never give unsolicited advice, particularly when it involves child-rearing. You really have no idea what is going on behind closed doors, or in doctor's offices. Oh yeah, rice cereal is AWFUL. But way to go. You are lucky your kids are healthy. I support you totally, April. I wonder why everyone gets all judgy about vegetarians when they merely are pointing out the facts. Feed your children natural, healthy foods, and they will be sick less often. It's a fact. I don't take your post as being smug at all. I take it as a dose of reality that others are afraid of. Keep up the good work. Eat healthy, be healthy. April's post clearly indicates "nearly vegetarian diet". Where did anybody get "vegan" from that?? Also, "Dan", your comment about the benefits of having a stay-at-home mother really mean so much coming from you. It's nice having a servant at home to do everything, isn't it? April, there is A LOT of truth behind your comment. I do not have any children but I did change my diet to mostly organic with vegetarian options when I was a teenager and I saw great improvement in my health. I don't ever get sick. Thank you Lord! lol But I honestly don't. I try to tell my friends when they are catching a cold to take a certain type of vitamin pack and they just look at me like I'm crazy as they chug all types of medicine (which never helps their situation). However, just like many of the people that responded negatively to your post, I have negative responses from people (no matter how nice I am about it) when I try and tell them that their diet could be what is wrong with their health (when they bring up health issues). It always seems to "fall on deaf ears." Oh well. Only a fool rejects knowledge. Maybe some parents read your response and did not find it to be pompous (because I didn't read it that way at all) and will consider changing their children's diets. I believe in a vegetarian diet but do not think that going organic will deal with issues. An organic lifestyle is something most people can not afford. I find high sodium content from basic things like bread and saturated fat to be big players in ill health.My family is vegetarian and we eat wholesome food most of the time.We all excersise very regularly too.That said, my child has allergies and the colds and cough visit us yearly.My belief is if we watch what we feed our bodies ( and our kids), stay active and decently manage the stress in our and kids lives ( all the extra curricular activities and running around! ), it should help us in staying relatively healthy ( and hence happy). Billions of chinese kids eat a high amount of salt every day and have done so for thousands of years, and look how they turned out. Sorry ... bad example. Yeah, they're all five feet tall. idiot! Yes, all active and healthy. As for the idiot who commented about height, your comment is invalid and ignorant. Natrldiver, think Sheldon Cooper and "sarcasm" from "go!" NatriumDriver, the comment on height is spot-on. Kids born in other countries to Chinese couples grow taller than their parents due to better nutrition. Also, Chinese people in China are not particularly healthy at all and that is due to dietary, pollution and infectious reasons. Diet does matter and so does sodium intake. Also, white rice is devoid of vitamins, protein and fiber and simply fills the tummy. Why is anyone surprised cr @p baby food is marketed which is loaded with unhealthy things like an over abundance of salt? I'm sure not. Have these food manufacturers no shame? If the kids don't eat the food, the parents will buy a different brand. That is the problem. Parents will need to tolerate a kid not liking a food while they adjust to a low sodium diet. Until the parents change, the food producers wont. Nope! It's all about the money to them. Very sad. Only fed that crap to the twin grandchildren once. They ate if but from then on we make all the toddler meals for them minus the salt. Well of course they are, the low salt toddlers taste awful. Agreed. I prefer to eat toddlers well salted. 😉 They taste better with salt and pepper, too. Everyone's meals are soaked with salt in the US. If you want healthy food Screw them all and prepare your own meals. When they're sales go down they'll learn. Not until them. N one wants to find the time to prepare healthy foods ( or to learn to cook, for that matter) and it cheaper and quicker to give kids food that we've been told for decades is safe for them. Obviously, today, that isn't true. Take the time, turn off the TV, and at least fix a healthy one-skillet meal for the family. You'ld be surprised how much money you save when you start making things on the stove, too. i've found having the TV on while I make dinner has no effect on the nutrional content of the meal. I read somewhere that there is more nutrition in the box than there is in the cereal,!!! Also, did you know that if the ingredients say 'cellulose' it means sawdust. Just saying. Wait, what? That's not true at all. Cellulose is the material which makes up a plant cell's outer wall. It can come from trees and every plant source you know, but it's the same chemical makeup regardless. Besides, the wood pulp that is used is generally used in the industrial world, not in our food. ......What you DONT WANT TO FEED YOUR KIDS? : ..............................................................republican LIES. The truth is in the middle. You're both st00pid aye holes. Now take your drivel somewhere else. Let's just feed kids only scientifically designed food pellets. We'll call them "Kids Chow." I think it is funny that doctors are telling us this. My Grandson's parents changed his diet – took out all synthetic dyes and went totally organic. His behavior improved and he is rarely sick as well. The doctors wanted to put him on all kinds of meds when changing the diet was all it took. There are some kids that may need meds, but more often than not what they need is real food. This is pretty much a no brainer. Nearly all prepacked food products contain significant amounts of sodium. Gotta read the nutrition label to see if the amount is unacceptably high for that particular meal's contribution to your/your kid's recommended daily sodium intake when all of the day's meals are considered. Also, since most people eat some amount of prepacked food throughout the week, remove the salt shaker from your dinner table too. You will get the sodium you need through those products. In our zeal for preparing for college education and encouraging young ladies to head for the work force, our schools have abandoned essential curricula like home economics classes and shop classes. The result is now two generations of Americans with little clue on how to manage a household and wholly dependent on "professionals". It was not home economics that taught cooking and cleaning. It was Mom and Dad. So more to the reason is working Mom is too busy to pass it on. Real Economics force people to have two income families. And our society has moved into a pay anyone to do everything that I can do for myself. Who changes their own oil today (I do, but I am weird)? Guys can't work on cars, woman can't cook. We have a more specialized, but less generally skilled society overall. So I guess I should take out the salt lick out of the crib now. I'll leave the water bottle in there though. It's amazing how articles like this bring out the self-righteous parents. You think your child will be healthy as a vegan? Unless you're supplementing his diet with brewer's yeast, he'll have macrocytic anemia with neuro problems within a few years. Growing up I ate a good mix between fast food, prepared packaged food, and home cooked meals. I played video games, and wasn't really all that active. Yes, I was a fat kid, also one of the better athletes in my class (leading scorer on grade school basketball team 4 years in a row, starter on offensive and defensive line in football, starter at defense on soccer). I was also a perpetual honor student and ended up in medical school, so I guess all that fast food and packaged food really screwed with my intelligence. My dad smoked 3 packs a day, mostly in the house, growing up, I've never had a single ear infection, and besides chicken pox and getting vaccinated, I never went to the doctor. The behavioral problems, the poor scholastic performance, the lack of athletic ability, and even the lack of overall general health all has its roots in either a child that does not feel loved and cared about, or a child that feels smothered. LOVE LOVE LOVE LOVE YOUR COMMENT AND I WAS RAISED THE SAME! I AGREE!! Oh LJ You are JUST AS PIOUS! Almost everyone is deficient in B12 and should take a supplement not just vegans. What a load of self-righteous arrogance, LJ. You're blaming autism on parents. Thanks for that. Yeah. I also get annoyed when self-righteous parents brag about using car seats. I mean afterall, generations survived just fine without those things. Sure some kids died in auto accidents that could have been saved by car seats, but that's beside the point because my grandma swears up and down car seats are not important and is just a way to "weasel money out of today's young parents". And people against child abuse...what a joke! Many kids are beaten and turn out okay. Thank you LJ for undeniable proof that a childs diet does not matter. You will make a fine doctor one day writing out all those prescription. I'm sure you will save and improve many lives with the mindset you have. Clearly diet does not matter, all we need are more MD's to write out more prescriptions, because that makes more sense than looking at nutrition. Technically, peridot2, the majority of the time, is is the fault of the mother. A woman only has a certain amount of time in which she is capable of producing excellent offspring, generally from the later teens to the late twenties. After which, the eggs she was born with begin to get genetically different with age. These genetic differences are the cause of autism in most children. As much as many women will not want to hear this, it is the truth, as I have learned from a geneticist (with her own children). Please, ladies, for the sake of your children, and your financial future, start having children earlier again! By the time you are in your mid-30's and attempting to conceive, your body is already past it's baby-making prime. @ DaMeglet – I take it you are not a parent based on your kind, understanding words. "an effortless way to pacify a rotten kid who's been spoiled with too many electronic toys and never been taught how to act." WOW – give you a gold star for being the most emphatic person I've come across today. Yes, I have been guilty of the occasional drive-thru; Spagettios & Kraft Mac and Cheese are a common weekend lunch treat in our house as are (gasp) hot dogs! Not to mention the full range of fruits, vegetables, fish, steak, cheese and other normal, healthy items my toddler enjoys. Until you actually have kids and get to experience their limited palettes and days where "I don't like it" limit your choices to yogurt, applesauce and a cheese stick, lighten up. Know that we are doing our best with both parents working, kids in daycare and trying to keep the peace on the weekends. You took the words out of my mouth. My 2 year old had 2 bananas, about a third of a pint of blueberries, and a string cheese for dinner last night. He didn't want the salmon and rice I prepared (which is a miracle in and of itself, being a working mom). Some days, you do what you have to do to get your kid to eat. I'm a mom to and I get so tired of hearing people talk about their kids being "picky". A child absolutely CANNOT develop a preferance for junk like fast food and hotdogs on their own. My son is almost 5 and has never been exposed to anything like that. There's never been a need. If he refuses one healthy thing being offered then I offer another healthy option (broccoli or spinach? strawberries or blueberries? chicken or fish?) There is absolutely no reason at all to serve your family things like spaghettio's. People want to make every excuse in the world about why they don't feed their kids healthy, but the fact is if you're not doing it then you're kids are not your priority. I make everything from scratch and I don't spend much time at all cooking. It really doesn't take much time. Like today I made kefir, yogurt, whole wheat pancake mix (ground my own wheat berries in the blender as well), strawberry/spinach popsicles, boiled eggs and a batch of granola bars and was in the kitchen just under 50 mins including clean up time and prepping dinner in the slow cooker. Now we have snack foods for the week and dinner was ready and waiting for us this evening. It takes no time at all to wash an apple off or peel a banana. Healthy eating doesn't take much time. In fact I will argue that it takes longer to go out to eat or wait for pizza delivery than it does to make your own healthy meal at home. Steam some veggies and quick cook a protein and dinner is served. If parent's spent as much time and effort on their children as they do making excuses for why they can't give thier kids the time they deserve, then society would be much better. As it stands we have kids growing up feeling like they are nothing more than burdens to their parents because it's "just too hard" to do right by our kids these days because heaven forbid we give up a little of ourselves to do whats best for the little people we bring into this world. These meals aren't just high in salt, they taste nasty. I am a mother with a full-time job (the type many might think would be enticed to be a "lazy parent"), and I would never feed this stuff to my kids and I don't know any of my peers (mothers with full-time jobs, kids in day care) who would. It just looks gross. If I wouldn't eat it, why would I feed it to my kids? Also try eating the "lunchables", pick any one of them. You will never buy it again. Anything that comes in a package, that you did not make yourself, and can have a shelf life, has to have salt to preserve it. Same thing with canned soups, sauces, anything, salt, salt salt. Make your own mac and cheese, will taste tons better, is not that hard or time consuming to make and everyone loves it. People are just too busy to cook. Yeah right. The other day I worked 9.5 hours, changed the brake pads on my car, ran 6 miles, and still had plenty of time to cook a wholesome meal and get 8 hours of sleep. I guess if I watched the American average of 4 hours of TV per night I would be too "busy" but as the saying goes "people will make time for what they value". I agree with you. People are constantly going on and on about how "busy" they are when, in fact, they are lazy and probably siting in front of the TV or computer! My husband worked swing shift while our kids were young and I worked days. I made a healthy balanced dinner every night (except Friday which was fast food night...moderation is a good thing), helped with their homework, gave them their baths, read books to them and/or sat and TALKED with them or even played games with them. Don't have children if you aren't prepared to spend time with them. Kids don't "act up" when you give them your time. Once they were in bed I could relax for a time before I went to bed. It is not rocket science, people. A little planning and organization on your part and things usually run pretty smoothly. For those claiming a vegan or vegetarian diet is the only solution... Hate to break it to you, but the human brain began to evolve the way it did once humans started cooking their meat. There is nothing unnatural or unhealthy about eating meat. What does make it unhealthy is all of the hormones, preservatives, and other junk companies put into it! Who on earth thought that this would ever be a good idea? Good grief. Foolish to believe parents that fail to read the nutritional information on packaging for their kids will read this article. Why do big corporations hate Americans? Why else would they doom small children to health problems later on by creating and marketing foods that are outside the acceptable guidelines for 'health food.' They foist a bigger burden on our healthcare costs by creating unhealthy patterns early on. Why do big corporations hate Americans? I cannot, for the life of me, figure out why they would do that. Can somebody who works for a big corporation please answer those questions? How about MAKING your children's meals! Cook it yourself. Not hard. For babies, a blender or food processor, some Ice cube trays (don't need that TV-advertised stuff). For toddlers, cook and cut up. Good grief, people - how lazy or busy can you be - it's your child! I laugh when they say americans eat too much sugar. Those people are not reading the ingrediants on the pkg. Some are 32 to 37% sodium. While sugar will make you fat, sodium will give you high-blood pressure, stroke or heart attack. You should not eat anything above 10% sodium. Adults need to start reading the labels for themselves also. Those food producers could cut that sodium in half and most people could not tell the difference. Studies about sodium and blood pressure showed that extreme salt intake would raise the blood pressure 3 points on the high side and 2 points on the low side. This just shows that the sodium bad guy is nonsense. Start cooking food at home for your angels and heroes. Mothers? Did you just say mothers should cook healthier? What century did you grow up in? This is the new millenium buddy. Dads are expected to pull their weight. And let's be clear about something, keeping up with a toddler all day is hearder and more stressful than most jobs. I've always found that moderation in just about anything is key. When my kids were young I made dinner every night (and, yes, I worked outside the home). We ate a balanced meal of meat/fish, vegetable/salad and even a starch, noodles/potatoes/rice. They drank lowfat milk everyday as well. On Fridays they were allowed to eat at a fast food restaurant and we usually went out to dinner once a week. My kids were rarely sick and were not fat. I made an occasional dessert and everyone was "satisfied". If you constantly deny your kids (or yourself, for that matter) food that everyone likes it will cause problems down the way. The problem today is too many people eat way too much processed food. They rarely, if ever, have a homecooked meal. Exercise also plays a big part in kids/parents being healthy. Bike riding, running around playing or participating in sports/swimming rather than sitting in front of the TV/computer all day is the way to go. I suspect you mean "complementary", not complimentary. English is dead. I love my pickles matwe cmon mate hmm hmm hmm. Mate you hurt my feeling. Lets go mate! have you guys tried the mcbites mate? What I find funny is how parents get so mad when their children throw fits when they feed them baby food. Well have you ever tried baby food? It's disgusting – No wonder why kids throw a stink! Seriously! We've been pretty aware of what we are eating as of late. I've been making it a point to stay away from sodium, and pretty much any processed foods. We are working with the kids to try to eat more like us, but it is certainly a challenge. They are 2 and 3.5, so they are a little picky about what they eat, and there is often a time crunch in feeding them, but I think we are doing a pretty good job giving them home-cooked meals.